Last Trek Report – Spring 2008, Kali Gandaki Trek – March 20 – April 3 - Trekking in Nepal with Teresa, Slow Trekking for peoples of all ages. 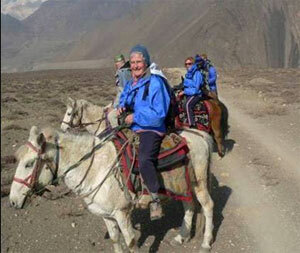 Slow Trekking in Nepal in Everest, Annapurna and Langtang region for peoples of all ages. 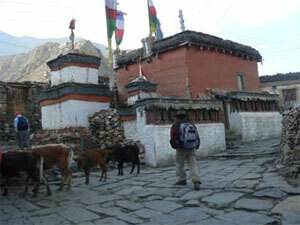 This is our new trek to Muktinath. It is quite a bit shorter (6 days on trek) and easier (no stiff climbs) with two mountain flights and an extra day for sightseeing in the Kathmandu Valley. So, here we are! Robyn from St Leonard’s, Isobel and Anton from Geelong, Rikki from Apollo Bay and her friends Cis and Betsy from the Eastern hills of Melbourne made up the group for our first Kali Gandaki trek. I hadn’t realised that it was the main day of the Holi festival when we set out after breakfast to do a little banking and shopping in Thamel. The eerie quietness of the street, punctuated by the odd ‘splash’ as a little plastic bag of water narrowly missed us, should have given me a warning. By the time we neared Chetrapati it was reminiscent of Baghdad. VERY BRIGHTLY COLOURED water bombs soon found their targets and we were a sorry sight as we fell desperately into the doorway of the Weizen Bakery. Anton had a lot of dark blue water on his lovely new bush shorts and Rikki looked quite different with swathes of bright red in her hair (kind of groovy actually). We watched a raging street battle, about 50 locals versus 50 tourists, giving it everything in the hot midday sunshine. We escaped in two taxis and came back to a calmer scene in the evening for a lovely dinner and a bit of pre-trek shopping. Our bus trip down to Pokhara next day was a much more relaxing affair. Dorje travelled with us. Lahar met the bus and I rode into town on Roden’s motorbike. It was quite hot when we arrived in Pokhara at 2.30 and overhead fans were soon whirring. Difficult to shop for warm jackets in these conditions but it was lovely out on the lake in the sunshine as the clients paddled out to the Peace Stupa on the hill. 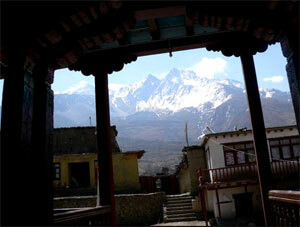 Our flight to Jomsom was delayed for hours. Pokhara was hard to discern through the fog from the dining terrace at the little airport. However, at 10.30 it was ‘game on’ and we quickly piled into our little sixteen-seater for a spectacular flight. Cleared Gorepani with only metres to spare. The uninterrupted tree-top canopy of red rhododendrons was awesome. Peaks were not so clear till we broke through the clouds. Nilgiri South loomed impressively over the airstrip at Jomsom. It doesn’t seem this big when you approach it gradually. Landing after 10.30 involves a banking turn in the valley and then battling a stiff breeze to put the plane down gently from north to south. Most exciting! By the time we had breakfasted at the Marco Polo lodge the wind had become even stronger for our walk down to Marpha and Tukche. Still, the sun shone and the peaks were stunning. The lovely old salt-traders house at Tukche was perfectly designed for us – solar room on the roof, attached bathrooms on the rooms, hot table for dinner. Welcome to Nepal. Day two of our trek was as clear and sunny as a travel brochure picture. We took a leisurely stroll about the village in the still, sun-soaked, morning, visiting two old gompas but found the distillery temporarily closed. We crossed the river just outside Tukche this time. The trail on the East bank is through orchards and juniper woods, across a rocky landslide and then through the Tibetan Refugee camp at Cheuro for a cup of tea in some interesting company. After a nice slow lunch and a bit of shopping in the tourist dives of Marpha with its quaint, whitewashed architecture of narrow lanes, we headed off with the wind at our backs for a tea-stop at Mangal’s mum and dad’s place. 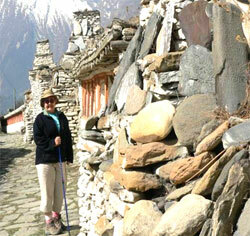 Robyn and I took the high trail to Jomsom from there, a stiff climb but a really unspoiled village. The men were having a rather boozy archery competition while the women gambled with cowrie shells. 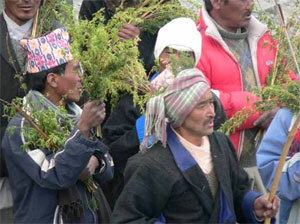 After a short delay for the bank and the checkpoint in Jomsom, I caught up with the customers near Kagbeni. This is an extremely flat walk through a very harsh, dry environment. 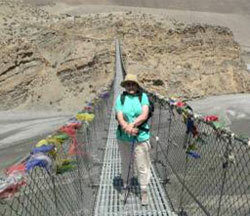 We are walking in the river bid of the Kali Gandaki most of the time. There is just one tea stop on the way. We had plenty of time for a side trip in Kagbeni and we soon had a fantastic plan, thanks to Lahar. He discovered last year, during the Upper Mustang trek, that it is now possible to walk into the ‘forbidden kingdom’ just as far as Thiri. 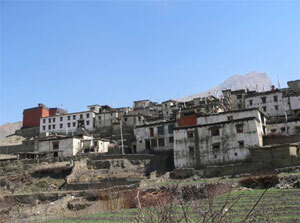 This is the small village you can see from the checkpoint at the back of Kagbeni village. It has 15 interconnected dwellings house about 85 people. We were welcomed by Pema to tea and popcorn and a look at her lovely old puja (prayer) room. I’ve dreamed of crossing this frontier for a long time. Thanks Lahar. The lodge was packed to the rafters but somehow great meals were delivered. Next day our ponies were a little late but that meant it wasn’t too cold when we set off. The ride was really good, great to get off your feet for a few hours and enjoy the scenery. Some of the members were ‘feeling the altitude’ a bit as we arrived in Muktinath at 3800 metres so not all of us made the final climb to the temple. 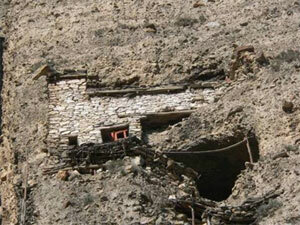 We looked in at the Vishnu shrine and then visited the very old gompa behind it. 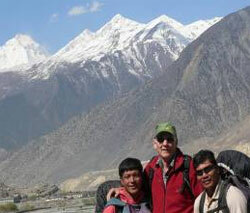 Ran into our English chums and we all walked up beyond the temple complex to glimpse the amazing Thorong La pass. Even in the sunshine, from the bottom, it looks daunting. Met a few heroic souls who had just done it. One of these days ……..
Rikki made this borrowed hat look so Dutch! After a lovely sunset the temperature plummeted and drove us all into the hot tables. 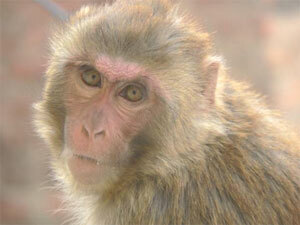 A very sick Nepali girl was grateful for a little advice and a couple of diamox. 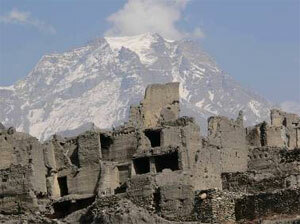 From Pokhara to the temple at Muktinath in one day! A bit ambitious. Our descent back to Kagbeni was in glorious full sun with hardly any wind till later. Somehow Rikki and I lagged behind a little and soon lost sight of our group. Explored Jarkot and trotted back very, very slowly. A perfect day. Glad we didn’t overdo it on the trail as we needed all our energy for dancing in the kitchen that night. I think it was a young English girl’s 19th birthday. We didn’t really need an excuse. 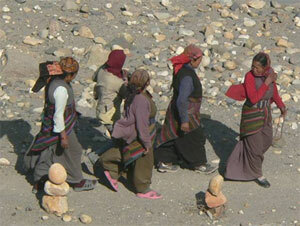 The walk back to Jomsom was easy; we are fit now after a week of walking. Weather in Jomsom was not suitable for an afternoon walk so, after waiving off Kaji, Ram Kumar, Prem and Purna in the jeep, we huddled round the hot table with a few rum and cokes. Good choice. Flight down was on schedule and the views were impressive, particularly the rhododendrons around Gorepani. Never seen them this good; a carpet of red! Pokhara is warm and soft to come home too. Clean clothes, warm showers, and big breakfast, everybody happy. After a couple of leisurely days in Pokhara, with a fair bit of shopping for clothes, silver jewellery and shawls and scarves, we enjoyed our bus trip back to Kathmandu. Well, until the traffic jam at the end. We inched through the ugliest part of Kathmandu for a couple of hours but our little minibus was waiting and the rooms at the BPD monastery seemed so comfortable, the bathrooms so-o-o-o-o clean. Home away from home. Cis, Rikki and Betsy headed up to Nagarkot overnight for a day-walk down to Bhaktapur next day as customers for the Everest Trek started to trickle in. 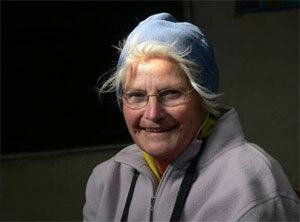 Larraine was so early for her trek she actually attended the farewell dinner for this one. We had a pizza night at Fire and Ice, complete with Chocolate Mouse (well done Anton). Eric arrived from Germany, Isobel and Anton headed off for America (via Norway wasn’t it??). 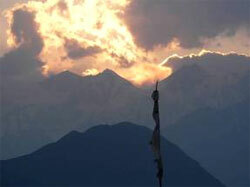 The Everest trekkers are pouring into Kathmandu now. It is only Netra’s consummate skill with the minibus bookings that keeps the flow in and out of Kathmandu going smoothly. Mangal’s wife Juna and their little baby Pari and Dorje’s lovely new wife Laki and his little ‘mini Dorje’ called Sonam all made visits. I think this new programme really worked well. Still quite challenging at times but plenty of time before and after trekking to catch up with yourself. I liked it. Still, better get ready to ‘do it all again’ because now we have eleven new customers who want to see the big peaks. So, thanks for coming Cis, Betsy and Rikki. See you later Isobel and Anton; I think you may do a bit more trekking one of these days. Robyn, I think that after three treks, you are now an honorary local. Next time you come as a friend.